Happy Twinsie Tuesday polished world! How are you today? I'm actually thrilled because this post almost wasn't going to be, but here it is! I cannot begin to describe the disasticure that I had when I first sat down to do this red manicure for American Heart Month. Now, before I go into the disasticure, I should begin by mentioning that I generally dislike red nail polish. The only reason I own red polishes is because my mom likes them, and I need them for holiday nail art. It never has been a go to base color for anything. My reds always stain my nails or cuticles, and are just impossible to clean up. So, the disasticure. 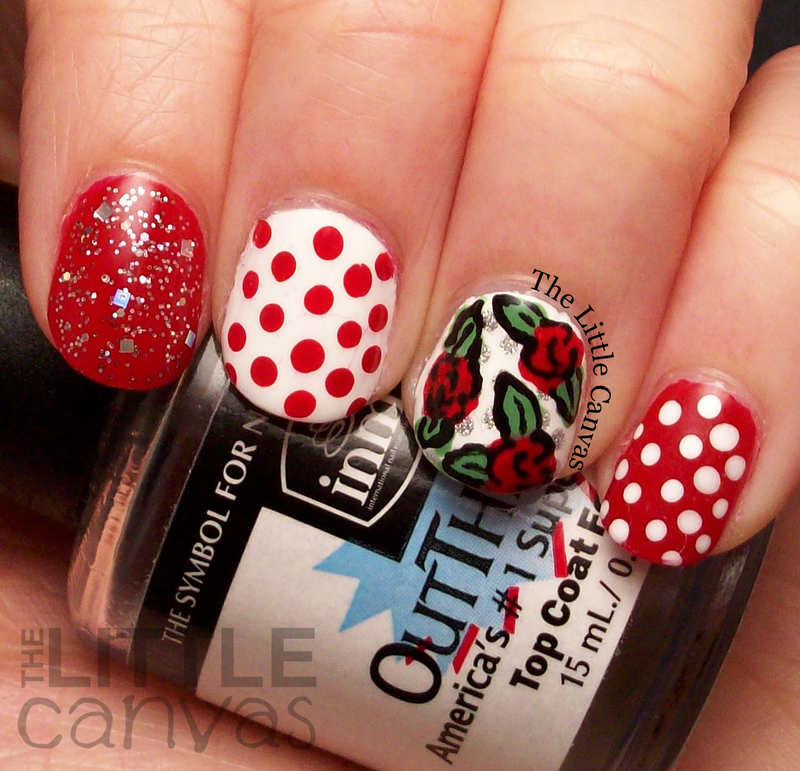 I had the cutest idea for a kitchen sink manicure which included dots, hearts, and lots of red. I painted on my base coat, started designing, and well it's impossible to draw a larger sized heart on a nail with red polish without it streaking or just turning out awful. I was too frustrated to continue so I just quit and had stained nails. Then on Superbowl Sunday when I was going through my "Food" board on Pinterest to find a biscuit recipe, I stumbled upon this amazing manicure by The Nailasaurus. During one of my late night pinning fests, I must have pinned it to the wrong board and totally forgot about it. I'm so happy I found it though because not only is it a red manicure, but it is totally perfect for Valentine's Day! I am sad it doesn't contain any hearts for American Heart Month, but hey, it's red, that's all that matters, right? This manicure makes up for the disasticure! I kind of like The Nailasaurus's manicure better because her dots are perfect. I always feel like my polka dots are wonky. I switched up my manicure just a tad compared to what Sammy did with hers. 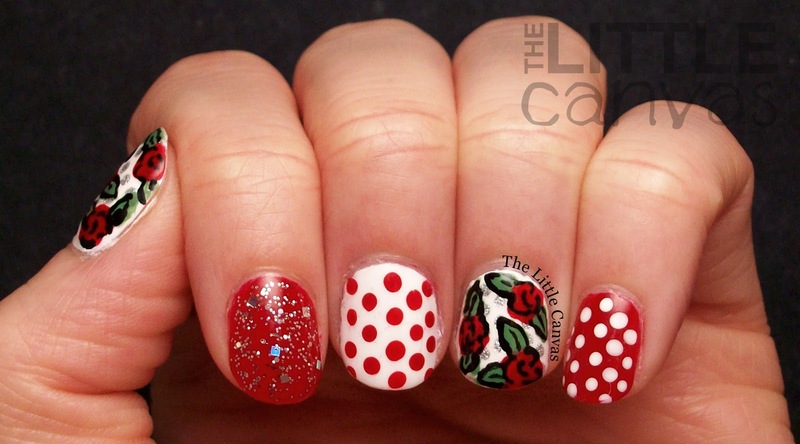 As you can see, on my thumb I decided to do the same rose design that was on my middle finger. 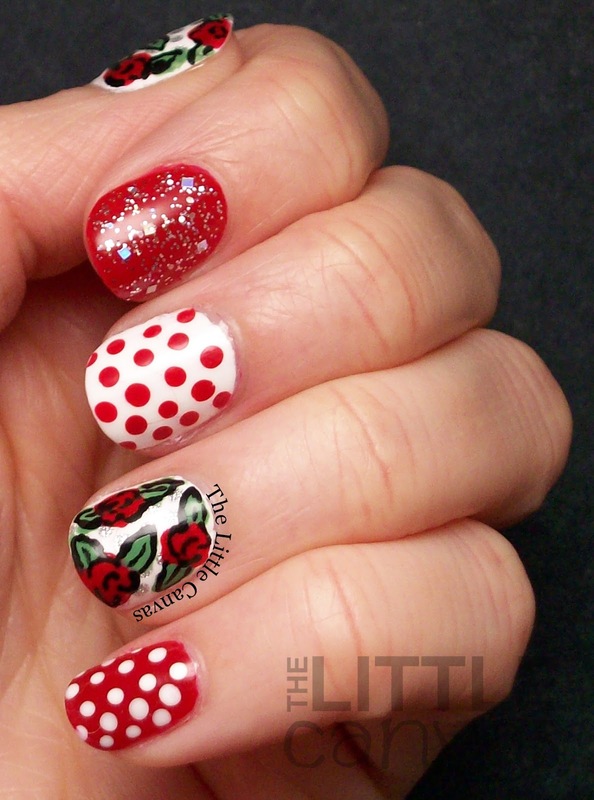 On these nails, I also did a background of This Crown Needs a Gown dots before I put the roses. I think Sammy did the silver dots afterwards. I'm not hating it. You can't really hate on Zoya Livingston, it is kind of a perfect red. Then when I added In True Stefani Fashion (the worlds most perfect glitter), my hate for red started to diminish quickly. Can we just take a minute and drool over how pretty that glitter is? Square holo pieces...how could you go wrong!? What do you think? 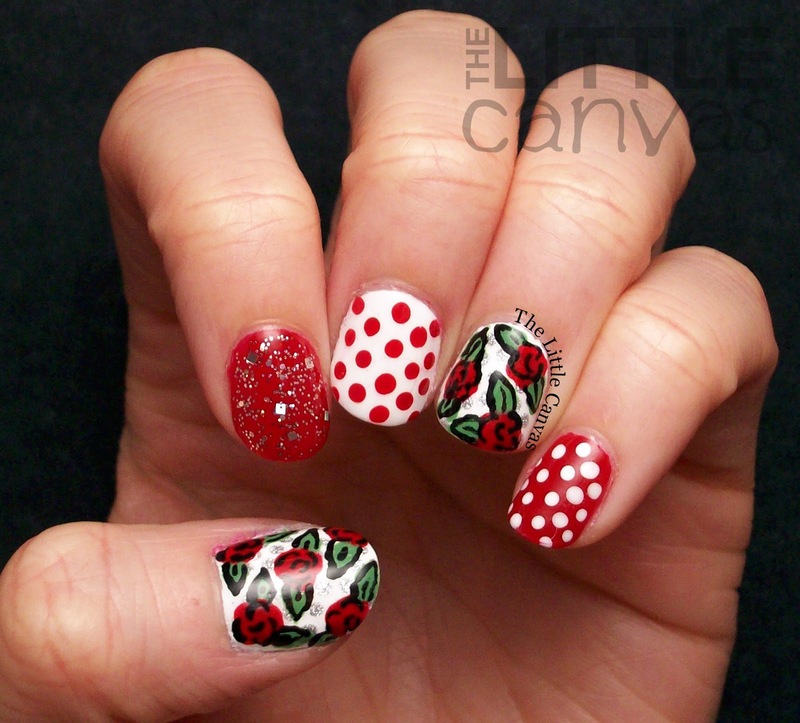 Liking this red nail art? Are you a fan of red polish? Don't forget to check out the other Twinsie's posts! I bet they they incorporated hearts. Sigh. Maybe next time.